We got up early this morning in order to get to the Magic Kingdom when it opened. We were hoping that it wouldn't be quite as crowded on a Sunday morning, and we were right. For the first hour and a half, we basically walked on rides. 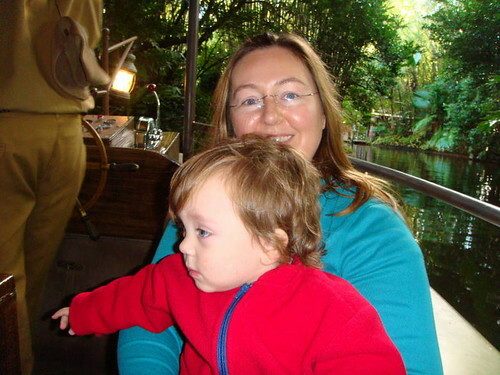 We started on the Jungle Cruise and were on the first boat out. Carter seemed to like that pretty well. We decided to ride Pirates of the Caribbean again, and then made out way over to ride It's a Small World again, all with no lines. Carter really likes It's a Small World, and at the end of the ride turned around, grabbed my face, and kissed me. It was so sweet! Carter was really getting into it too, and started saying "Bye boat" whenever we got off a ride. 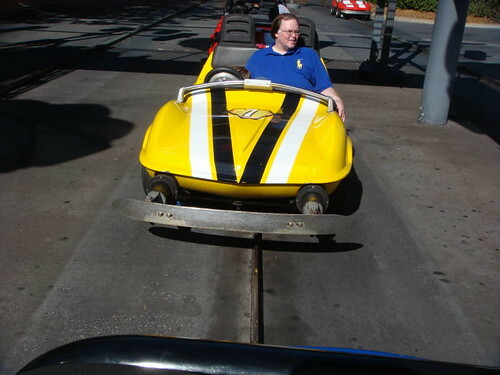 At that point we were in Fantasyland and decided to try to ride as much as we could. By the end of the morning, we'd ridden almost every ride Carter met the height limit for, much to our amazement. He was really getting into it too, and started pointing out the things he wanted to ride. He asked to ride the carousel ("Ride horsie!") 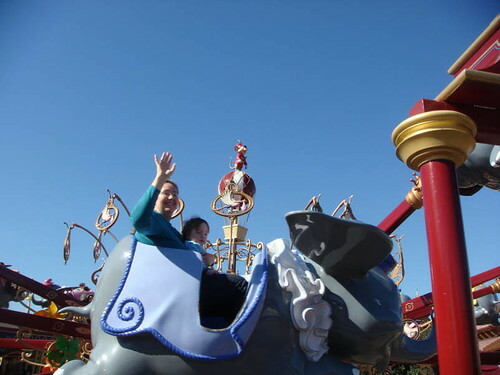 and to ride the Dumbo ride ("Ride elephant, up up in the sky!"). 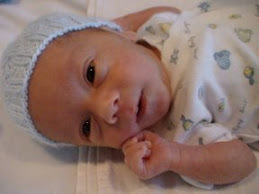 You can't really see Carter well here, but it was the only picture that wasn't blurry! 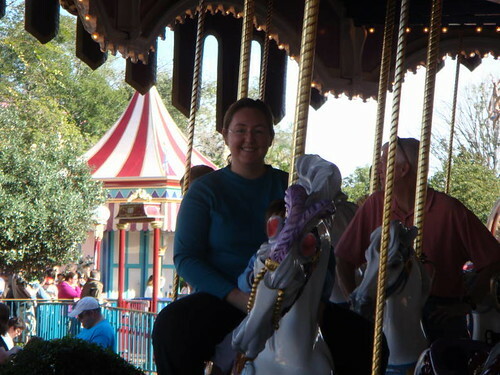 We also rode most of the indoor rides in Fantasyland, including a Winnie the Pooh ride, a Peter Pan ride, and a Snow White ride. The only one I think we missed was the spinning teacup ride. After lunch we decided to see if Carter met the minimum height for the race car driving ride, and it turns out he does, at just over 32 inches tall. He and Doug rode that one together while I rode in front of them (in order to get a picture). Doug said Carter really likes it and even did a lot of the steering. 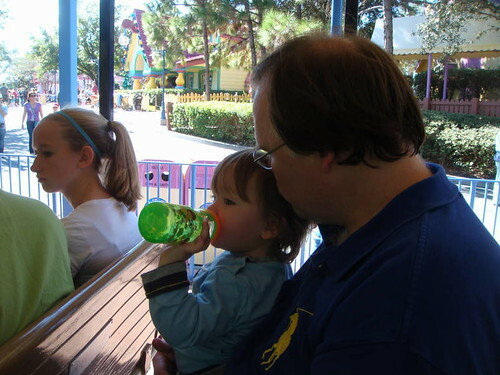 After a brief stop in ToonTown to let Carter play on a playground, we rode the train. After about two stops, Carter fell into my lap and asked to nurse, and was asleep before we made it all the way around the park. He slept all the way back to the hotel, and then for another two hours! Overall it felt like a really successful amusement park morning. By today Carter understood that we were there to look at things and ride rides, and he was really getting into it. He would get excited when we got him out of the stroller to get in a line, and he would point to the ride when we got up to the front and say "train!" or "boat!" He sat in my lap for most rides and looked around with wide eyes at everything. It made me realize we are going to be able to take this kid to amusement parks from here on out. He really enjoyed it! Carter doesn't recognize many Disney characters, but he does recognize Tigger. We saw a costumed Tigger and Pooh today, and Carter got really excited. He was waving and saying, "Hi Tigger!" The line was really long to get a picture, but now I'm sort of wishing we'd gone to get one. Of course, up close I'm not sure how Carter would have reacted to a 6-foot-tall Tigger! We got him a little stuffed Tigger, and he loved that. He carried it around and gave it lots of kisses! 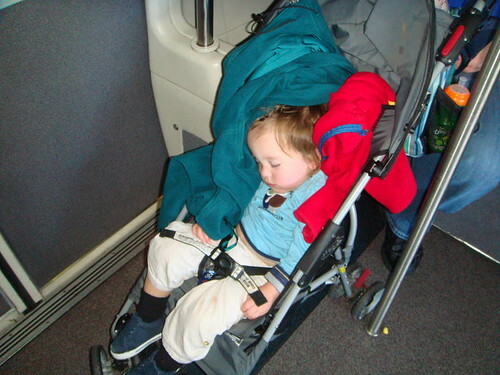 But he'd definitely get to a point that he was done with the stroller and wanted a chance to run around. We realized early on in the trip that we had to save the playground time for the end of our time at the park, because once he'd been able to run around for half an hour, it became very difficult to get him back into the stroller willingly. It was like the stroller had become a symbol of his oppression, LOL. It took all of our parenting creativity to get him back into the stroller without a tantrum, and we got really good at it by the end of the stay. After a nap this afternoon we went back to Epcot and had dinner in a beautiful restaurant in the Mexico section of the park, and then strolled around to look at the Christmas decorations. There were lots of little Christmas plays going on and there was a beautiful choir singing, so it was really a lovely evening. Epcot really grew on me over the world. It's a different kind of park from the others, and it's not about the rides at all. I wouldn't have expected to like it so much, but I really do. But it's been a lot of fun! Aidan and Emma have a new Blog!